Michigan. The Hi 5 state? A girl walks up to the door. She's got long blonde dreadlocks with a scarf around her head. She pulls her chain wallet out of her back pocket and opens it up to show me her i.d. I ask her to take it out of the wallet and she does. I look at the i.d. and notice that the picture is very dark and that the background seems foggy. Looking closer at the i.d. I notice that the lettering is blurry and some of the words are so fuzzy that they're hard to read. In the girl's picture on the i.d. it looks like she has either a shaved head or her hair pulled back. Even that was hard to tell. So I turn the i.d. over and check the edges and find that the i.d. is starting to come apart on one of the corners. I ask her for another form of i.d. and she says she doesn't have anything else with her. I explain to her that I'm keeping the i.d. until she can produce another form. She tries to argue but leaves when she sees that I won't budge from my decision. After looking at the i.d. and noticing the dark background, fuzzy lettering and dark picture, I knew something was up with it. When I noticed that one of the corners was starting to split I knew that the i.d. couldn't have been real. After the night was over I took a closer look at the i.d. I never want to take apart a fake i.d. just so that I can show it to my other doorstaff and give them reference material for when they're working the door. I did notice what looked like a 2nd i.d. underneath the top layer. After showing the i.d. to a few people I decided to take it apart. I used some adhesive removal liquid and slowly removed the top layer. Underneath that layer was the girl's real driver's license. As you can see by the picture, the real i.d. is much brighter in color. The lettering is much easier to read and the picture is much easier to see. You can also see that she was four years younger than what the top layer had claimed she was. 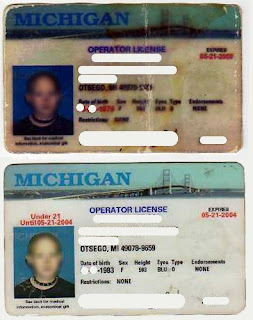 She had removed the Under 21 lettering that was above her picture, changed her birth date and she change the expiration date. She didn't change her license number or any of the other information. 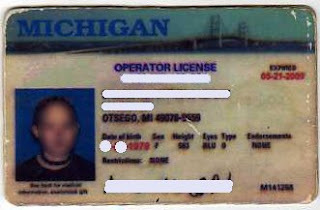 One of the things that she couldn't change or even put on the top layer is the hologram that Michigan uses on their i.d.'s. Holograms very rarely can be added to fakes in a manner that they look real.